The 3 over rule is how you tell if the infertile days before your period have begun. 3 over 6 does not mean assuming you are infertile because your period is due. You might have a random long cycle and still be fertile - especially if you've been stressed or ill.
3 over 6 means using your waking temperature and vaginal fluid to confirm that ovulation has been and gone, which means your released egg or eggs have dissolved, and you can't get pregnant till your next period begins. Your waking temperature goes up after ovulation and stays up till your period starts. The amount of fluid you produce rises just before and during ovulation and drops after ovulation. You will probably have between 10 and 14 infertile days before your period. But this varies from woman to woman. Some will have only 8 infertile days - or none at all because their data is unclear. If you have more than 20 days of higher temperatures you are probably pregnant. day one of your period - the first day of proper bleeding – enough to need a tampon, pad or mooncup. your maximum fluid days - the two or three days each month when you notice lots (and I mean lots) of vaginal fluid when you use the bathroom. 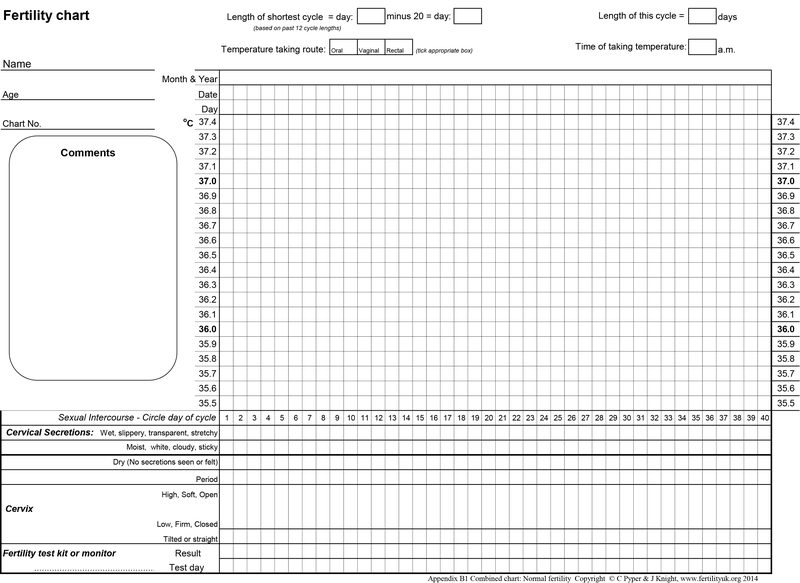 You also need to record illness, or any stress or medication that might affect your cycle, waking temperature or fluid. Which thermometer, app and chart? Buy a normal fever thermometer with one decimal point (Celsius). I like this iProven thermometer because it's fast and quiet. Feel free to use a two decimal point thermometer if you prefer - it makes life slightly more complicated but might mean more interesting data. Record your information on both an app and paper - at least to start with. You can switch to an app-only approach once you know what you're doing. Print my paper chart from this link. It's a simplified version of the Fertility UK chart, which you can use if you prefer. You'll also need to download at least one app. I recommend Kindara, even though it's a bit complicated. You can read more about apps and devices here. What does 3 over 6 look like? 3 over 6 means your temperature goes up and stay up till your period starts. You confirm your temperature information is correct by noticing your most fertile vaginal fluid. Your final very fertile day should be before your first higher temperature. Your infertile (green) days start on the evening of the third higher temperature day. The third higher temperature day should be at least 0.2 degrees celsius higher than the previous six days. If it isn't, wait another day to make sure your temperature stays up and your fluid stays low. The first higher temperature day should be after your final maximum fluid day (see below). If it isn't, wait another day to make sure your temperature stays up and your fluid stays low. Vaginal fluid changes through your cycle - you usually get the most fluid when you are the most fertile. On your maximum fluid days your fluid should be clear(ish), very stretchy and thick - like raw egg white. Your first higher temperature day should be AFTER your final maximum fluid day. If it isn't, wait another day to check that your temperature stays up and your fluid stays low. You could just rely on fluid - or temperature - but 3 over 6 works best if you use both. Is that it? Is that all you need to know? It might be. When I first learned about fertility awareness I read an entire book about all the hormonal and physical changes and had a couple of chats with a knowledgeable friend. Since then, thanks to my reading, my training as a Fertility UK practitioner and my client work, I have become fluent in fertility awareness acronyms and jargon - and I'm still learning. But I also love simplicity. Even when I first learned about fertility awareness there was part of me that thought "couldn't you just have told me about 3 over 6?" So you could say I've jumped straight to the best bit of fertility awareness - but don't dismiss learning more. We don't all have textbook cycles. Learning more and getting support can make everything easier, and more effective. Check out the resources and references below - or get support from me. The fpa's guide to natural family planning. Fertility UK website, especially Getting Started. The Complete Guide to Fertility Awareness. Jane Knight. Authoritative textbook for health professionals, researchers, and anyone who wants to use fertility awareness. Jane Knight runs Fertility UK. Taking Charge of Your Fertility. Toni Weschler. Bestselling US fertility awareness book. Massive, but very helpful and readable. Buy the print version so you can make the most of the illustrations. Frank-Herrmann et al - one of the most useful research articles. Clinical guideline. Faculty of Sexual & Reproductive Health. Royal College of Obstetricians & Gynaecologists. Affiliate links: There are some affiliate links on this page, which mean I get a a small payment if you buy something. You aren't charged extra and I don't link to anything I don't like.